The internet stops me from using this cat’s true name in the headline: Pallas’s Cat as apostrophes don’t work in file names and the file name should be the same as the headline. Sorry for that. The other English name for this cat is Manul. The latin or scientific name is Otocolobus manul. 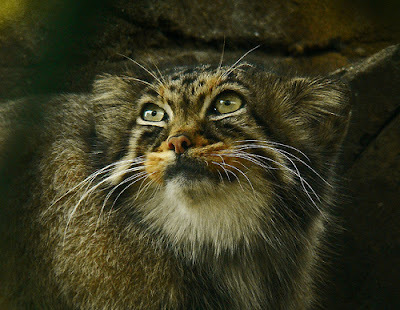 I will generally call this cat pallas cat in this article. The scientists prefer manul. A translation of the Russian and German name for this cat is: Steppe cat.You can see how complicated it gets even at the level of the name! Its name comes from its discoverer, a German zoologist and botanist, who worked in Russia after being invited in 1767 to become a professor at the St Petersburg Academy of Sciences by Catherine II who seems to have been a great admirer. 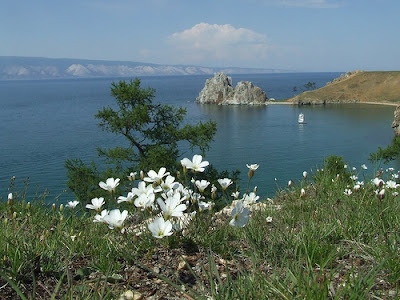 He completed two expeditions into deepest Russia, reaching as far eastward as Lake Baikal (see photo below – part of the range of this cat) on the first expedition (between 1768 and 1774) and discovered Pallas’s cat. He wrote about his findings in a 3 volume book called: Journey through various provinces of the Russian Empire. The pallas cat is, I think it fair to say, very distinctive. It’s appearance (and I mean head/body conformation or shape) is different; much in the same way the shape of the Jaguarundi (weasel looking) is different. This difference comes from the roundness and shortness of the head (the skull more accurately). In fact its skull is similar to that of the sand cat. This is considered by some to represent an advanced state of development of the “domestic cat lineage”. It is thought to have split from the domestic cat lineage early on (the pallas cat is the only cat in the domestic cat lineage to not carry a specific gene common to other ancestors of the modern domestic cat). So what does this distinctive cat look like? The pallas cat is similar in size to our well known domestic cat, weighing between 2 – 4 kilogrammes (4.4 lbs – to 8.8 pounds). In fact, it is probably a little lighter than the domestic average at around 8 lbs. As stated its head is round with a low or flat forehead and its legs a little short. The fur is long and the tail very bushy. Looking at these pictures taken in captivity, this cat seems friendly and inquisitive (looking at the camera) and mild mannered, which is in fact the case. Apparently in captivity they show no fear. However, in captivity they fail to thrive as offspring frequently die at a young age. This is thought mainly to be due to the parasite toxoplasma gondii. The reasons were being researched. The facial markings are actually very strong but vary in intensity. There are distinct white bands bounded by black running from the corner of the eyes going back and down slightly. And on the forehead there are black spots. The tail has black bands and a black tip. The coat is quite plain and heavily “ticked”, which is a cat fancy term meaning broken coloration by the agouti gene. It is designed, of course, to blend in, which it does very successfully. The coat nicely matches the rocky outcrops of the uplands and hilly areas that it occupies. See another Pallas cat picture. This is set out on the customised map embedded into the page below. The original map can be refined by anyone willing and able to do so. It is a public map. It probably needs refining despite the care taken to produce it because it is from a smallish map (IUCN Red List of Threatened Species™ (Red List) and in any event the distribution of wild cats is ever changing (diminishing and becoming more fragmented usually). There would appear to have been considerable fragmentation and some shrinkage over the last 10 years. What is the landscape like within the pallas cat range? The pallas cat mainly occupies the central Asian steppe grassland areas of China, Mongolia and the Tibetan Plateau. In some places it lives at a higher altitude as in Tien Shan and Gobi Altai where it lives at 3,000 – 4,000 metres above sea level (note: it may be extinct from the Gobi Altai as at 2009). This cat is limited in respect of habitat by its ineffectiveness in continuous snow cover of 15 – 20 cms deep. reduced prey population. This is caused by people poisoning the cat and over hunting of its prey. The poisoning is not directed at the pallas cat but animals that are thought to carry and transmit bubonic plague (central China) and to protect grazing land (west and north China). 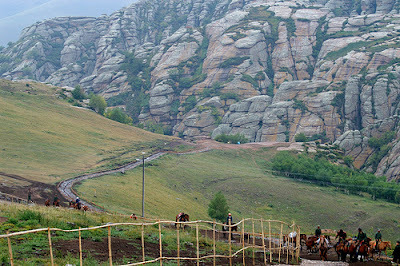 degraded habitat due to livestock and agriculture. degraded/destroyed habitat due to mining (Russia and Central Asia). hunted for the fur (in Mongolia it is still legal to hunt this cat under conditions, which are not enforced. This is a scam, I allege). Listing under CITES Appendix II (prevention of trade in body parts but is it enforced?). Hunting is banned except in Mongolia (a major part of the cat’s range is in Mongolia). Bizarrely it is considered Near Threatened in Mongolia but that status has not encouraged the authorities there to protect this cat. 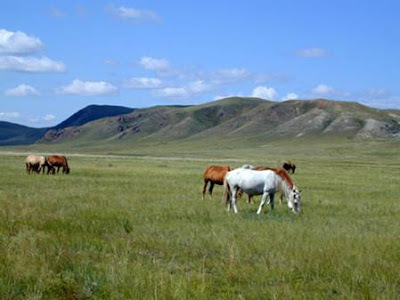 Although, 12% of the range in Mongolia is “protected”. However, the areas are unprotected. Clearly the government has no regard for this species of animal. There are a considerable number of reserves, parks or protected areas in Russian and China but I often wonder what these actually mean. On occasion there would seem to be little difference between reserves and non-protected areas. Are they a misrepresentation of what is actually going on? 6% of the pallas’s cat’s range is protected in Russia (one can’t call that generous). I would like to mention a conservation group: http://savemanul.org/eng. This is a Pallas Cat Study and Conservation Program. It would seem to be run by Siberian Environmental Center. A July 25th 2009 posting on the site talks about the tracking of a female manul and her kittens. They had taken up home under a hut but she moved home 0.6 miles away (a considerable distance with kittens) and found a burrow. The prey was plentiful (rodents – Mongolian gerbils (Meriones unguiculatus)). These observations took place in The Daursky State Biosphere Reserve (Zapovednik) – see photo below. Conservation seems largely to do with study as many wildcat species are still little understood. Manuls spend daylight hours in burrows, crevices or caves and come out in the late afternoon to hunt. As their small ears (and flat forehead) are adapted for the open terrain (i.e. small) this cat hunts mainly by sight. It creeps up on prey and ambushes it as running is not one of their strengths. Its fur is also well adapted to the terrain in which it hunts, camouflaging this cat very effectively. The pallas cat merges beautifully into the background. 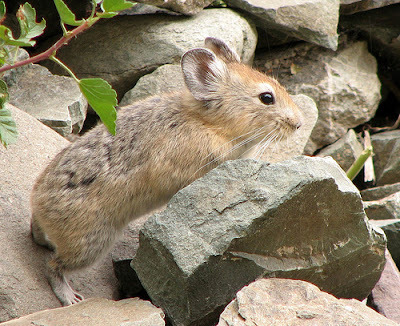 pikas (a mouse hare) – weighing 100 – 400 grams – found in 82% of scats (droppings) so this is a popular choice of prey. Pikas are active in the daytime so the manul is considered to be “diurnal”. This means active in the daytime. See the photograph of this animal below. 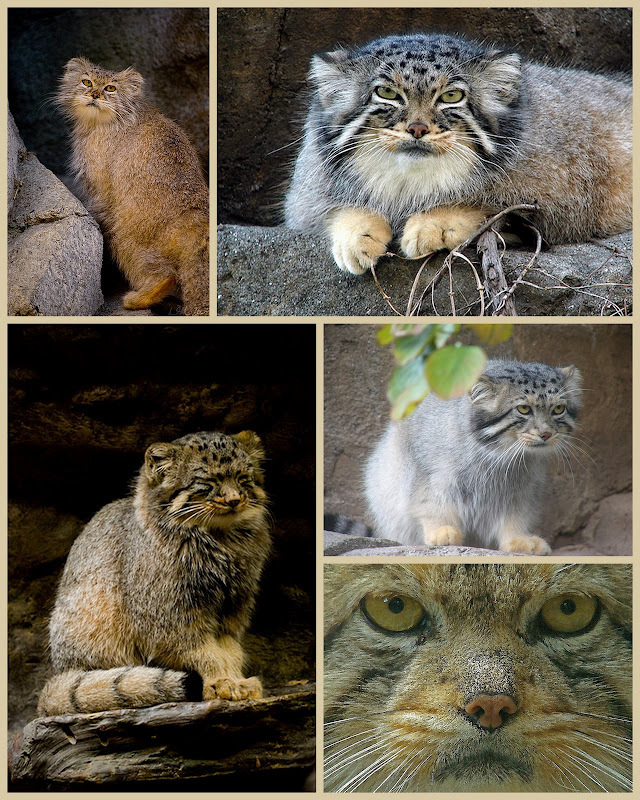 The manul is a successful hunter and likes a full belly. One had 16 voles in its stomach! Update: hear some Pallas cat sounds. Event Duration – information etc. Gestation (pregnancy) Two research programs, two findings: (1) 66 – 67 days or (2) 74 – 75 days. Kitten size at birth 89 grams (male) – this is one sample of course. They are born blind. Average lifespan 8 -10 years in the wild and about the same as the domestic cat in captivity (15 years should be about the non-purebred average domestic cat lifespan). This entry was posted in Manul and tagged manul, Manul Description, pallas cat, pallas's cat, small wild cat species, wild cat species by Michael Broad. Bookmark the permalink. Hi Anette. Thanks for stopping by and commenting. Running a website about cats, I have to mention the cat breeds which leads to getting to know some breeders, who become friends, so I do have a problem criticising cat breeding. However, at heart, I am in harmony with you on this because there are too many unwanted cats. I agree. I took in a mother Bengal and her two daughters in because the breeder couldn’t sell them after a year of asking me to take one. My kind-hearted mom said, “Oh bring all three of them.” Now, I don’t even have a job anymore. However, I’m glad they are here, because I don’t think they could be separated. They cling to each other like monkeys. They are always bunched up together. Very cute. Sometimes, the 3 of them pile up on top of me while I’m sleeping and I can’t move. Luckily, my sister’s friend decided to quit breeding Bengals. Thank God. There are enough pets getting abandoned all over the place. I think cat and dog breeding should be outlawed because it has gotten way out of control. Someone dumped a pregnant female in my neighborhood (and who did she make a beeline for? Me!) about 6 months after I took in the Bengals. She gave birth within 2 weeks after I took her in after realizing she was pregnant. She gave birth to 5 babies. So, we ended up taking in 9 cats within a 1 year period!!! I couldn’t find homes for them either and they live here wreaking havoc. They are super cute, though. So people should find some other ways to make money. People should also choose going to a shelter over a breeder as well. If purebreds are what they want – there are a bunch at the shelters. Poodles, German Shepherds, Chihuahuas, Maltese, Bichon, etc. for people looking for dogs. There are Persians, Abyssinians, Siamese, Bengals, etc. for people looking for cats. Great comment. Enjoyed reading it. I totally agree with you. There is a pet shop near me where they sell kittens. I like the people and the products but hate the fact they sell animals. Horrible. They just don’t think about the consequences. You have done really well taking on these cats but…too much really. It is the same old story, people like you and me mop up the mess that others create. The irresponsible lean on the responsible. It was ever thus. People who care about animals can’t say no to saving an animal. where do you buy a pallas cat ? You can’t buy one for a pet. They are a true wild cat and rare. You couldn’t keep one in a private zoo without having proper facilities and complying with any regulations. I am not sure what the regulations are where you live but in some states in the USA it would be illegal to keep a Pallas’s cat. They are protected and export from Asia is banned I would have thought. Someone in the USA probably keeps one but they are very rare. Sorry but hope this helps. I like looking at pictures of these wildcats. it makes me sick that people are breeding and selling these as exotic-domestics. I hope they start to do more to protect these beauties in the wild. it would be a shame to see them become extinct. Absolutely. I have always said that we should be spending far more time and effort on protected wild cats in the wild rather than trying to breed them in cages. It seems mad to me and very self indulgent and human-centric. Did you even read the article?? Wtf! !